These categories correspond to the three tabs available to the end-user in the Coveo Desktop Integration Package Options dialog box (see Desktop Integration Package Configuration and Control). The setting is not forced by the GPO and the end-user can change the corresponding parameters. The registry is not modified. Deactivates the setting. The end-user cannot change the corresponding parameters. 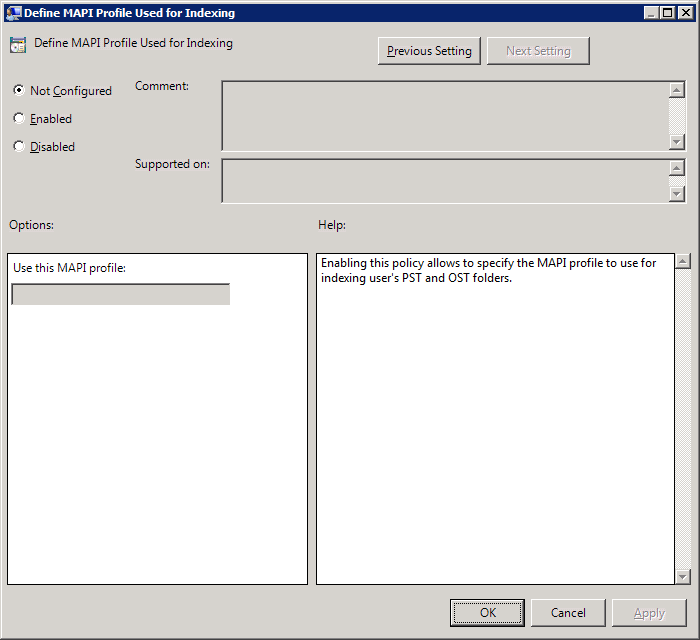 The registry reflects that the policy setting is not selected. Activates the setting and allows to set a default value by GPO for the corresponding parameters. Depending on the parameter, the end-user can or cannot change the values. 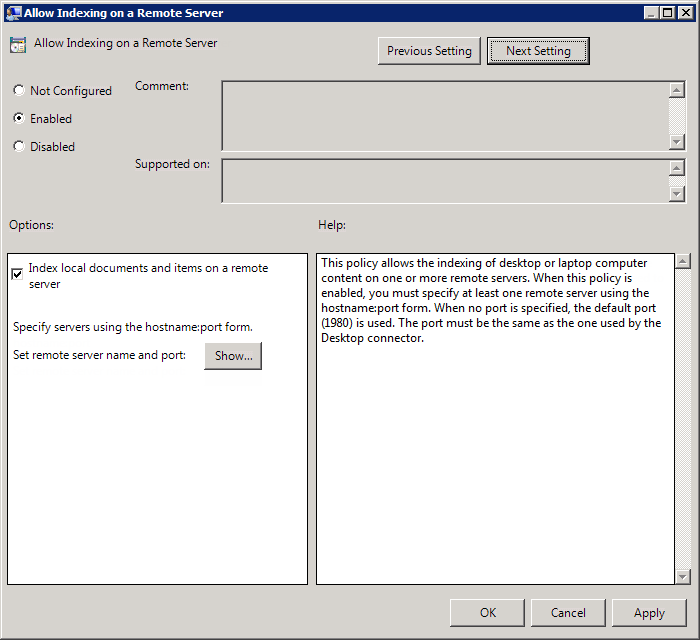 The registry reflects that the policy setting is selected. Note: This procedure is documented for a Windows Server 2008. 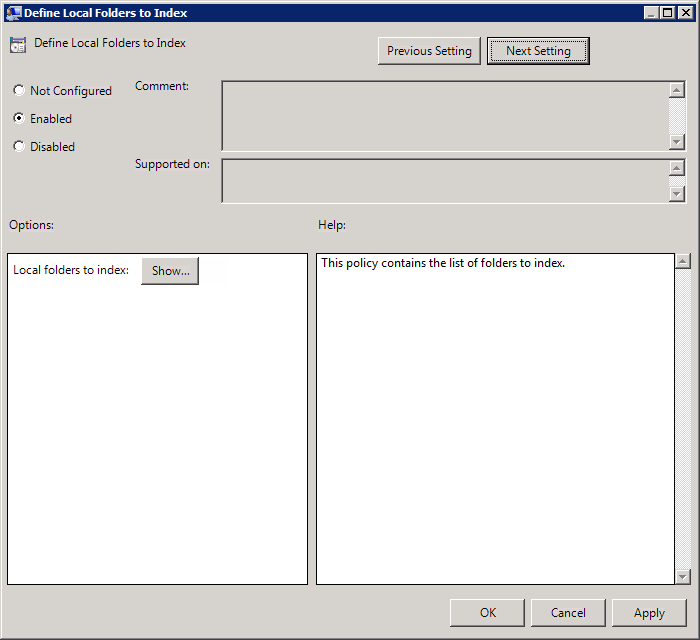 Permissions to create and edit group policies on the domain (at least a member of the Group Policy Creator and Owners). 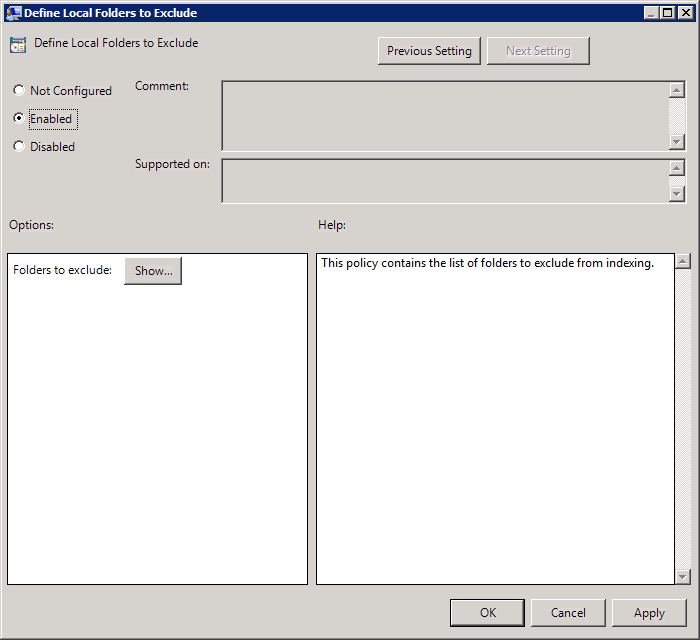 Access to the Group Policy Management Console (GPMC). Start the Group Policy Management Console (GPMC) (Start menu > Administrative Tools > Group Policy Management). In the tree, expand Group Policy Objects in the forest and domain containing the GPO for the Desktop Integration Package. Right-click the GPO for the Desktop Integration Package, and then click Edit. Expand User Configuration > Administrative Templates > Coveo Desktop Integration Package Configuration > General. 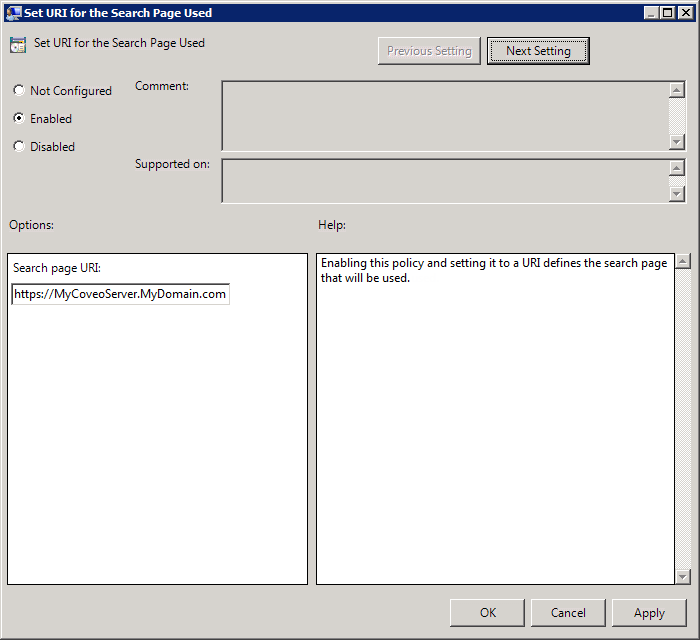 In the General panel, in the Setting column, double-click Set URI for the search page used. 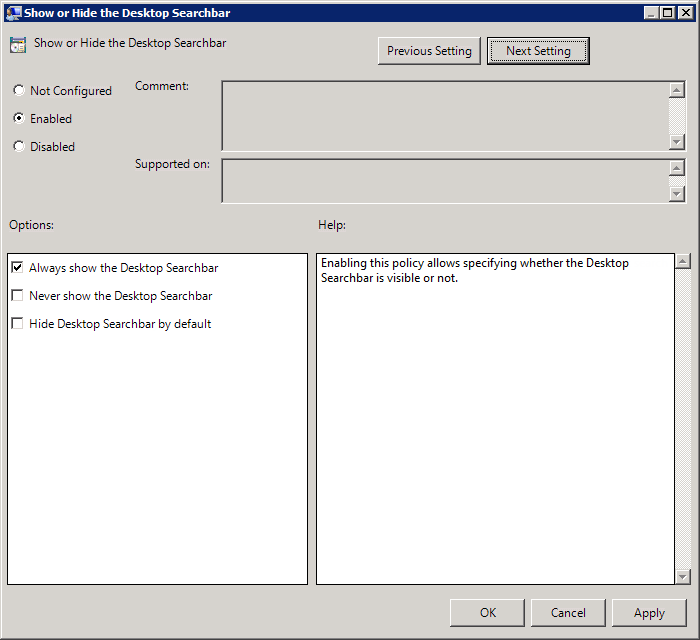 Select Enabled to set the Coveo Front-End server used by the Desktop Searchbar and the Outlook Sidebar. End-users will not be able to change the server. In the Search page URI parameter, enter the URI of the Coveo Front-End server. Note: The GPO does not verify the format the entered URI. Ensure that the URI entered is valid. Important: The URI of the Coveo Front-End server should be added to the trusted sites of the end-user Internet Explorer to prevent users from receiving frequent requests to authenticate themselves with their user name and password. Select Enabled to force settings that end-users will not be able to change. Select the Index local documents and items on a remote server check box. This enables indexing of the content from the desktop or laptop computer on which the DIP will be deployed. 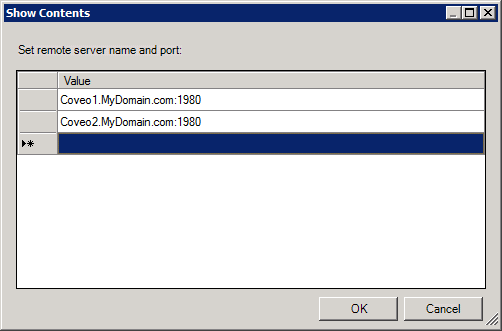 In the Value list, enter the address of the Coveo Back-End server in the [hostname1]:[port] form. You can add more than one server. This is useful when you run separate instances of CES in two or more environments such as Development, Quality Assurance, and Production. You can specify the CES remote server name and port for each environment in which you want desktop/laptop indexed content to be sent. Note: When no port is specified, the default value (1980) is used but it is strongly recommended to specify the port. The port must be the same value specified for the Desktop connector source (see Configuring and Indexing a Desktop Connector Source). Select Enabled to specify to either always show, never show, or hide the Desktop Searchbar. Always show the Desktop Searchbar: The user will not be able to hide the Desktop Searchbar. Never show the Desktop Searchbar: The user will never have access to the Desktop Searchbar. Hide the Desktop Searchbar by default: The user will be able to show the Desktop Searchbar. Select Enabled to specify to either always show, never show, or hide the Outlook Sidebar. Always show Outlook Sidebar: The user will not be able to hide the Outlook sidebar. Never show Outlook Sidebar: The user will never have access to the Outlook sidebar. Hide Outlook Sidebar by default: The user will be able to show the Outlook sidebar. In the tree of the Group Policy Object Editor, expand User Configuration > Administrative Templates > Coveo Desktop Integration Package Configuration > File Indexing. In the File Indexing panel, in the Setting column, double-click Disable Remote File Indexing Override. Under Options, select the Disable remote file indexing override check box. Select Enabled to force a default list of folders to index. In the Show Content dialog box, for each default local folder that you want to index, enter the folder full path, and then click OK. Select Enabled to force a default list of folders to exclude. In the Show Content dialog box, for each default local folder that you want to exclude, enter the folder full path, and then click OK. 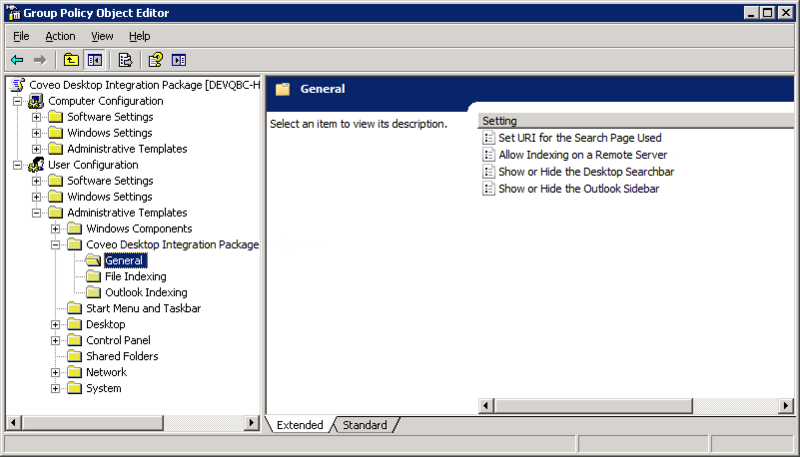 In the tree of the Group Policy Object Editor, expand User Configuration > Administrative Templates > Coveo Desktop Integration Package Configuration > Outlook Indexing. 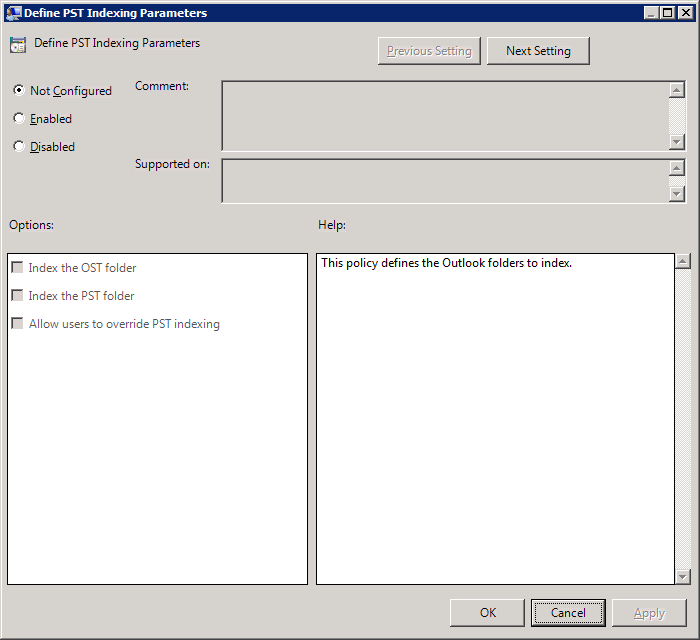 In the Outlook Indexing panel, in the Setting column, double-click Define PST Indexing Parameters. 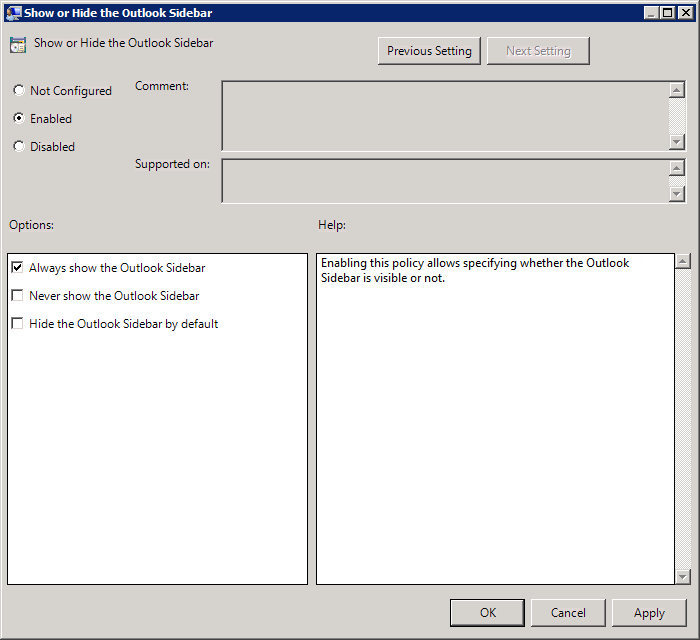 Select Enabled to set the default Outlook items to index by default. Select the Index the OST folder check box to index the local Microsoft Exchange Offline Folders (.ost) mail archive files. Select the Index the PST folder check box to index the local Microsoft Exchange Personal Folders (.pst) mail archive files. Select the Allow users to override PST indexing check box when you selected the Index the PST folder check box but still want end-users to be able to disable it. Note: The MAPI profile parameter is useful only when a user has more than one Outlook profile and wants to index the content of a specific one. When it is not set, the content of the default profile is indexed. Select Enabled to force a specific profile. In the Use this MAPI profile box, enter the name of the MAPI profile to use.